"You're free to go. You have twenty-four hours. If you don't make a kill, you'll get very, very sick. If you do choose to be one of us, you have to be back before sunrise. It's your choice." The ending has bite. I quite liked this one. 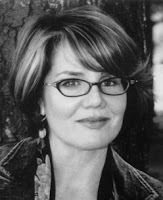 Libba Bray is the author of the Gemma Doyle Trilogy, which includes the novels, A Great and Terrible Beauty, Rebel Angels, and The Sweet Far Thing.